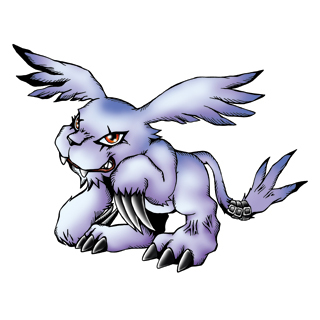 A Mammal type Digimon from which big, sharp claws have grown on his hands and feet. Although he probably uses both his hind- and forefeet like legs, as soon as the claws on his forefeet begins to evolve, he'll start walking on his hind feet---an unusual trait amongst Mammal types. He's a small Digimon, but he's quite violent-tempered and never allows himself to be domesticated. When he attacks, the claws on his forefeet prove to be very valuable assets, but outside of battle, he digs holes with his forefeet and enjoys seeing other Digimon fall into the pits he digs mean fully. His special attack is "Paralyze Breath", where he spits out a gaseous poison breath. Origin / Japanese. Gazi is another way of writing gaji, which is short from gajigaji, the sound of eating. Origin / Japanese. Gazi is another way of writing gaji, which is short from gajigaji, the sound of eating.